What Your Golf Course Wind Insurance Policy Must Cover | The Voss Law Firm, P.C. Outdoor venues are naturally more susceptible to damage from adverse weather events, and this is especially true for businesses that rely on smooth green spaces. Unfortunately, many golf courses never fully recover from wind and storm damage, forcing the clubs to suffer millions in lost revenue. Attorney Bill Voss explores the specific challenges faced by golf course owners due to high winds and how to get proper coverage for all types of wind damage. From public courses to private country clubs, Texas has some of the most beautiful golf courses in the nation. While most owners seek out robust flood insurance policies for golf courses, many overlook the necessity of having coverage specifically for losses due to wind damage. Commercial policies that offer coverage for rain, lightning, or even hail often exclude damage that is caused by wind alone, leaving policyholders to pay for those losses out of pocket. Property losses. 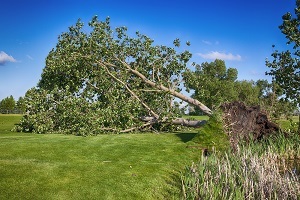 Like any good property damage policy, wind damage insurance should cover all of the property, including greens, tees, lost personal property, and structures. The coverage limits on the clubhouse and the property as a whole should meet or exceed the most recent financial appraisal of the course. Examine your policy for language that can limit coverage in certain circumstances (such as “per hole" limitations) and make sure the policy states that “all playing surfaces” are included. Debris removal. Wind can knock down a few branches or even fell whole trees, causing thousands of divots and shredded bark to litter the greens. Your cleanup policy should include costs or debris removal, tree and stump chipping, and divot fills. Vehicles. Courses range from having one or two golf carts to hundreds of carts and a fleet of commercial vehicles to shuttle visitors around the property. If your policy offers replacement cost coverage for vehicles, your insurer pays the full value of the vehicle and you will not have to pay out-of-pocket for lost depreciation. Electricity losses. Downed power lines may interrupt electricity to your property for a day or more, resulting in lost retail revenue, lost business hours, and an inability for the course to generate income. If the course does not have a backup generator, a power outage may mean inactivated loss of lights, locks, and alarms, opening the property up to potential thievery, vandalism, or looting after dark. Finally, power outages before major tournaments or other events can cause catastrophic food spoilage, causing the loss of valued clients and a damaging effect on the club’s reputation. Business income losses. The damage to structures and greens may cost much less to restore than the damage to the club’s revenue stream. If both the short- and long-term revenue are not protected, owners can suffer multi-million dollar losses in business income alone. Business interruption insurance allows property owners to calculate the value of day-to-day operations and secure the anticipated amount from the insurance provider. Clubs that host major events such as weddings, charity golf games, and PGA tournaments should have a clause that specially protects these income-generating events, allowing owners to preserve their status and eligibility for future hosting opportunities. If your wind damage claim is undervalued, it could mean the loss of existing customers, potential new golfers, and even the club itself. If you are struggling to collect fair payment from an insurer after a wind storm, we can help you get the payments you deserve for property damage and business income, allowing you to rebuild to the standard your customers have come to expect. Simply fill out the form on this page today to contact the Voss Law Firm or order a free copy of our book, Commercial Property Owners Must Read This BEFORE Filing an Insurance Claim.